From Friday afternoon June 28 to after midnight Sunday June 30, the UCB Theatre in NYC hosts a long-form improv marathon. 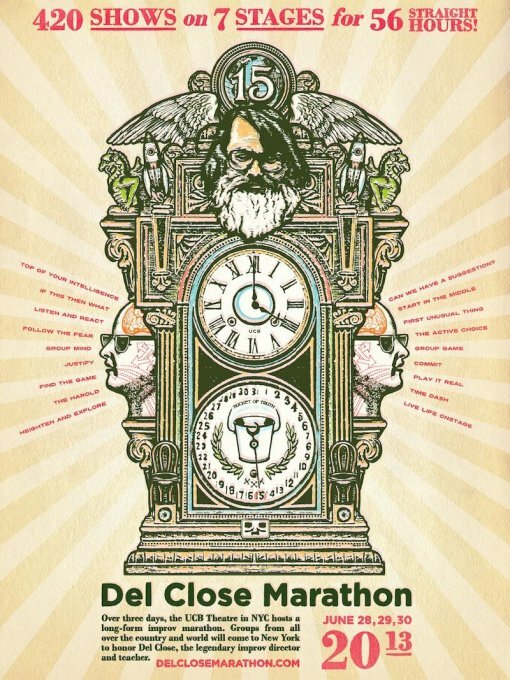 Groups from all over the country and world will come to NY to honor Del Close, the legendary improv director and teacher. You can buy a weekend pass to see all shows at any of the venues during the marathon for $30, or you can buy tickets for individual premium shows ahead of time on the website (see schedule for individual premium show listings, which include all shows at the SVA and FIT stages, as well as the Sunday night Asssscat shows). Check out the full DCM 15 schedule over here. DCM 15’s line-up of premium shows after the jump.